First get the roasted eggplant and garlic going. Toss them with a little salt and the olive oil and spread them out single-layer on a lined cookie sheet. Roast for about 20 minutes or until nicely browned, turning once with a spatula after about 10 minutes. Remove Set aside. Once cool, peel and mince the roasted garlic. Combine all of the meatball ingredients in a large bowl. Use your hands or a food processor to incorporate the ingredients. Form the mixture into 1-inch balls (you can make them larger if you prefer). Heat about 2 tablespoons of oil in a large skillet over medium-high heat and brown the meatballs on all sides. Transfer the meatballs to a plate and set aside. Add the red onions and the oil if more is needed and cook them until soft and caramelized, about 6-8 minutes. Add the red bell pepper and cook for another couple of minutes until softened. Add the wine and bring it to a rapid boil. Boil for 2 minutes. Add the roasted eggplant, roasted garlic and all of the sauce ingredients, except for the olives, parsley and mint, and bring to a boil. Reduce the heat to medium-low and simmer uncovered for 10 minutes. Return the meatballs to the sauce, cover and simmer for another 15 minutes. Add salt and pepper to taste. Add the whole Kalamata olives, cover and simmer for another 5 minutes then stir in the chopped parsley and mint. Garnish with some extra parsley and mint and serve with crusty bread, rice or orzo and a Greek or leafy green salad. 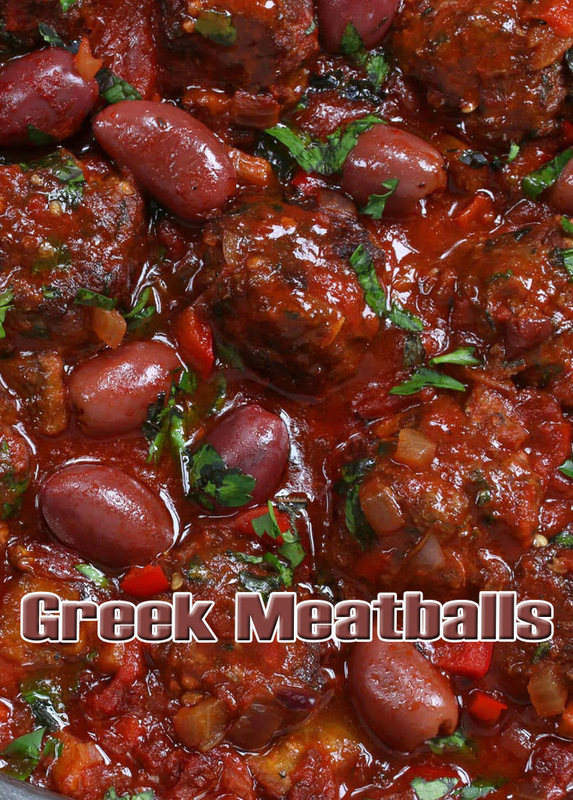 You can also served the meatballs sprinkled with some crumbled feta cheese. NOTE: These meatballs taste even better the next day after the flavors have had time to meld. So this makes a perfect make-ahead dish.